The pre-installed Office 2013 Home and Student edition gives you Word, Excel, PowerPoint and OneNote. Microsoft decided not to optimize the interface of either app to suit the Modern UI and instead just ported the x86 versions to the ARM platform. We can't really blame them for doing so, as the office applications are bound to be used with a keyboard and a mouse/trackpad anyway. Plus, Office isn't the easiest of apps to master, which means that a general design overhaul might have put off frequent users. All the functionality is there and, if you mainly use your PC for document editing, Windows 8.1 RT can easily pass as your daily driver. No matter whether you mean to create or edit documents, Windows 8.1 RT has got you covered. There's an easy to follow step by step tutorial for each Office application in case you're new to it. Word 2013 features the entire package - text formatting, headings, track changes, page layout, you name it. Windows 8.1 RT has an impressively ample selection of fonts, too. Excel 2013 is there for your spreadsheet needs. Formulas and calculation are all supported, and so are cell formatting options. You'd be hard-pressed to find a difference between Excel on your PC and the one on Windows 8.1 RT. 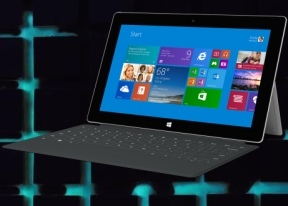 Creating PowerPoint presentations on the Microsoft Surface is as easy as on PC. You can choose between countless transition effects, animations and sounds. A presentation can be previewed and imported, and an existing file can be edited. OneNote 2013 is your one-stop app for taking and organizing notes on Windows 8.1 RT. The app has an interface similar to Word, but with less options. You can have multiple Notebooks in OneNote and creating one is done through a drop-down menu. You can choose the name of the Notebook and the color it shows up in, as well as whether to save it locally or in SkyDrive. SkyDrive can sync all of your Office 2013 documents between devices. All you need is your Microsoft ID. It's very convenient and sync is instantaneous. Your documents are safe in the cloud in case your PC needs a reset or is broken or lost. The Calendar app on Windows 8.1 RT is well familiar - it looks identical to the one on Windows Phone. You can set it to show events in Day, Week or Month view. There is no Agenda view so you cannot see a list of your upcoming events. Day and Week view are sorted by hours so you would need to scroll up or down, depending on the specific time of the event. Events are color coded depending on the type of calendar (your own, Birthdays, Holidays, etc.) and you can change colors to your liking. Setting an event is simple and straightforward. Thanks to the large screen you see all of the information without the need for endless scrolling. The Calendar syncs with Hotmail, Google and Outlook. Facebook is strangely missing here so all of your Facebook buddies birthdays will need to be manually entered. Those users who have their mind on productivity can count on the superb organizing skulls of Outlook 2013. The app is only available in classic desktop mode like the rest of the Windows RT 8.1 office suite. All in all, the organizing skills of Windows 8.1 RT have grown massively thanks to the presence of Outlook 2013. The latter was a glaring omission in the office suite of the OS's previous version.